Upon entering the Hynes, you will be subject to a quick bag inspection, along with metal detection using wands. This protocol is similar to what you may experience at an event at the TD Garden, Fenway Park, and Gillette Stadium. At most of these checkpoints, there will be a “Bag” line and a “No Bag” line. If you do bring a bag, please be prepared to have all pockets open ahead of time to help this process move faster. There will be lines. We have doubled the number of security stations from last year to help these lines move faster. It is still likely you will be going outside for some period of time. Please dress appropriately for the weather. If you would like a place to stash your things during the convention, there will be a coat check set up inside the first floor of the Hynes, at a cost of $2 per item. The line that forms at the Prudential entrance to the Hynes will back out into the hallway between the Sheraton and Prudential. This hallway is outdoors, uncovered, and involves stairs. Anime Boston has permission to use the Dalton Street entrance to the Hynes again. To reach this entrance, please exit the Sheraton main lobby and turn right onto Dalton Street. The doors between Artist’s Alley (Hall C) and the third floor of the Sheraton will be open this year. Last year, we experienced significant back up at this entrance to the point where it was a fire safety concern inside the Sheraton, and the entrance was shut off for some time. 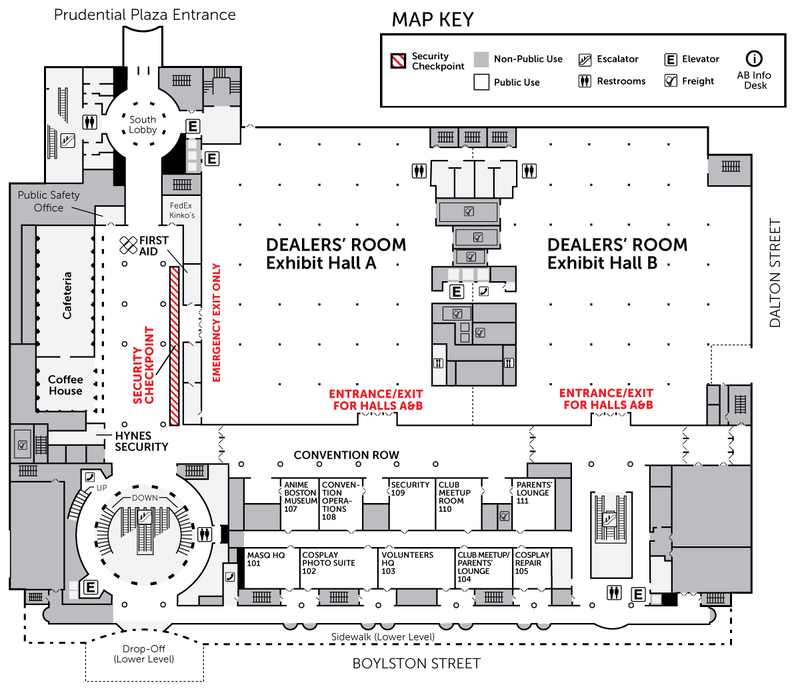 Anime Boston has reorganized the floor plan of the Artist’s Alley to allow for more security checkpoints at this entrance in the hopes that this will not be a problem this year. We will monitor this entrance carefully. 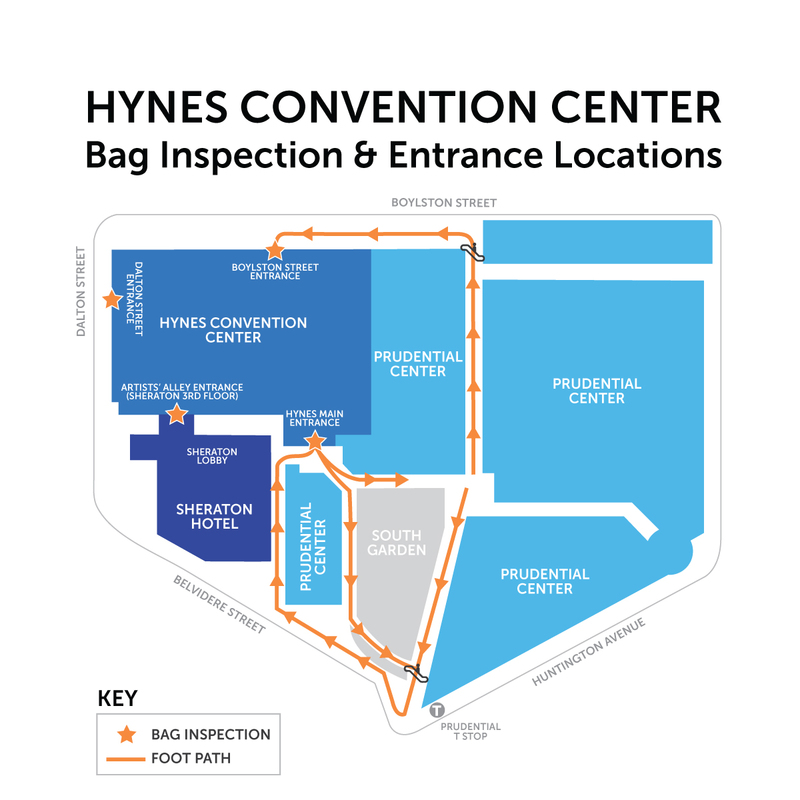 In order to accommodate the additional security checkpoints at the Prudential entrance to the Hynes, the checkpoints will now span the length of the hallway outside of the Dealer’s Room. Because of this, the Main Hall entrance to the Dealer’s Room will be used for emergency exit only. You will now only be able to enter the Dealer’s Room through the secondary hallway, located across from Con row. PREVIOUS POST Yousei Teikoku to Perform at Anisong World Matsuri at Otakon 2017 NEXT POST Meet Member Relations & Accessibility Services!